It’s been well documented that Wisconsin’s offensive line was a shadow of it’s former self in 2012. Even after the dismissal of Mike Markuson, the line’s play -though improved - was inconsistent and not up to past standards. There was hope 2013 would be better as only Ricky Wagner was expected to leave for the NFL. 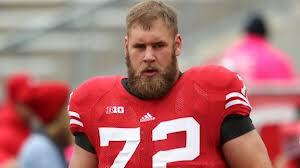 That all changed when Travis Frederick declared for the NFL draft shortly after the Rose Bowl. Wisconsin faces next season with far more uncertainty. Had Frederick stayed it’s likely Ryan Groy would have moved to LT to replace Wagner (where he replaced an injured Wagner against Minnesota) with some combination of Dallas Llewallen/Kyle Costigan/Zac Matthias starting at guard. With Frederick gone, the Badgers have a far more complicated decision to make about the look of the offensive line in 2013. Groy is the only player on the roster with any experience at center, a position he played briefly in 2011 when Peter Konz went down with injury. With Groy at center presumably (and I’m only guessing here) Rob Havenstein moves from RT to LT and either one of the experienced guards moves out to tackle and a new face (Voltz, Marz perhaps?) becomes a starting guard. Alternatively, but less likely, Groy moves to tackle and RS Freshmen Dan Voltz (backup center at season’s end) is promoted to starting center. The question is if a young player like Voltz would be ready to make the calls at the line required of the center. It’s doubtful any blocking scheme would be left in such an inexperienced player’s hands. Unfortunately neither alternative is particularly attractive. No matter what the offensive line’s makeup this unit will be a young one. Groy and Matthias (who has been a backup most of his career at Wisconsin) will be the only seniors in the entire group. An added layer will be adjusting to a new coaching staff. The offensive line will be on their 4th position coach in 3 seasons. There is no guarantee that TJ Woods’ line will look more like the groups from 2010 and 2011. Had Frederick stayed, the offensive line’s “field general” would have been a valuable piece in easing that transition. Finding a player to fill Frederick's shoes is no easy task. I'm surprised I'm talking about Devin Smith here. I can't shake the thought of his poor performance in the 2011 Rose Bowl. TCU's Jeremy Kerley had a huge afternoon as he humiliated the overwhelmed Smith. However, his absence due to a season-ending foot injury was notable, as he was forced to watch from the sidelines as his defensive teammates―specifically the secondary―were torched in the marquee games (e.g. Michigan State, Ohio State and Oregon). In fact, his absence was notable enough that former head coach Bret Bielema said he was the missing link to the Badgers being a national title contender. “I honestly think if Devin Smith had played the entire year at the way he was playing at the time he got hurt, we probably never would have lost,” Bielema said during a radio interview with ESPN Madison this past June. While there are many other candidates for the hardest player to replace on a squad that won its third-straight Big Ten championship, here is my take on why Devin Smith is one of numerous departures that is the hardest to replace. In the realm of college football, especially at Wisconsin, players traditionally make their way up the depth chart as they get older and grow accustomed to the their positional systems and Smith's maturation is no different. After being a huge liability in the secondary his sophomore year (see first paragraph), Smith grew into a solid cornerback opposite Antonio Fenelus during his junior year campaign. There was speculation if he could make the leap to the primary cornerback but his play quickly dissolved that kind of talk. While Smith was not the most physical cornerback on the team, he made a name for himself in pass coverage, developing into a ball-hawking cover guy and led the team and Big Ten in interceptions with four. He also led the team in pass deflections and pass breakups with 17 and 13, respectively. Moreover, he became one of the anchors of the defense that ranked 15th in total defense, 18th in pass defense and 17th in scoring defense. While his physical skills will be greatly missed next season, Smith's in-game experience is irreplaceable. Safety Shelton Johnson, Smith and opposite cornerback Marcus Cromartie are among the departures and the depth chart at the position is extremely young and depleted of valuable experience. The likely replacement for Smith will be sophomore Darius Hilary, who had an up-and-down year including getting beat on the game-winning overtime pass against the Spartans. Another possible replacement is junior Peniel Jean, who had a tough time getting in a rhythm due to a preseason foot fracture. Also, Devin Gaulden should see some playing time at the nickelback position. The jury is still out if any of these options can turn into a reliable cornerback on the outside but they will have to grow up quickly with some notable absences if the unit is going to respectable. With inexperience in the secondary, both former head coach Bret Bielema and current head coach Gary Andersen reached out to the junior college ranks, a move that UW had rarely utilized in the past. In fact, while at UW, Bielema had a verbal commitment from JUCO cornerback Tiquention Coleman, who has since followed Bielema to Arkansas. Smith's tenacity for the football and premium coverage skills will be missed, making him one of the hardest players to replace on the 2012-'13 squad. 5,140 career rushing yards. 598 career receiving yards. 83 career total touchdowns. 2-time first team All-American. 2011 Heisman finalist. 2012 Doak Walker Award winner. As much as Wisconsin is known to reload on the offensive line, the same can be said for the running back position. RBs James White (senior) and Melvin Gordon (sophomore) return to what should be a strong Badger team in 2013. But take a step back and look at what Ball did during his career. He holds the national record for career touchdowns, broke Barry Sanders’ single-season touchdown mark in 2011, and has a 5.56 yards per rush career average. Ball’s power running attack paved the way for White’s change of pace speed on the inside, and for Gordon to run the jet sweep around the edges. The stats speak volumes for what Wisconsin will miss next year, but the intangibles are also just as valuable. Ball’s leadership, work ethic and ball security are what the Badgers will miss most. It was noted several times during the last couple of seasons that Ball’s work ethic during practice motivated White and Gordon to work harder. He practiced at game speed and changed his body type in the offseason to address concerns with speed and weight. Ball did not lose a fumble during his career until this past season in which he fumbled 3 times (2 of those I argue were not his fault – helmet to helmet contact against UTEP and miscommunication on the final possession against Nebraska). Running up the middle and getting hit several times each play still gave fans, his team and coaches the greatest confidence that he would secure the ball each time. Many believe Wisconsin will just reload at the running back position with White and Gordon coming back. However, I don’t believe White is capable of being an every down back like Ball due to his size and not being able to break tackles as well as Ball. As for Gordon, he showed his speed and ability to break tackles late in the season but is still young and not as experienced. Until then, Ball will be a tough one to replace as players of his production don’t come around too often. Posted in Past Seasons and tagged with Montee Ball, Devin Smith, Travis Frederick. January 15, 2013 by Buckaround.